Just thinking about the scent of lavender can make you feel relaxed, and sipping a tea made from its leaves will even help you sleep better. While you probably know about the calming properties of this wonderful purple flowering plant, did you know there are many reasons to start putting it on your skin and hair? Lavender offers an incredible number of uses. So many in fact, that if you had to choose just one essential oil, this would have to be it. It’s been used for centuries for its cleansing, and healing properties, with ancient Egyptians using it as a perfume for the mummification process and Romans for its scent as well as purifying their baths. Today, almost everyone has at least one product that’s been infused with lavender – it’s become one of the most popular ingredients in skin care products, body oils and much more. When it comes to supporting the health and beauty of the skin and hair, you really can’t go wrong with lavender, however, there are some people who tend to have allergic reactions to it, usually in the form of a rash, which means that if you have more sensitive skin, perform a patch test before applying it and be sure it mix it in with a carrier oil like almond, olive or coconut oil rather than using it on its own. That said, if you don’t have a bottle at home right now, be sure to pick one up. 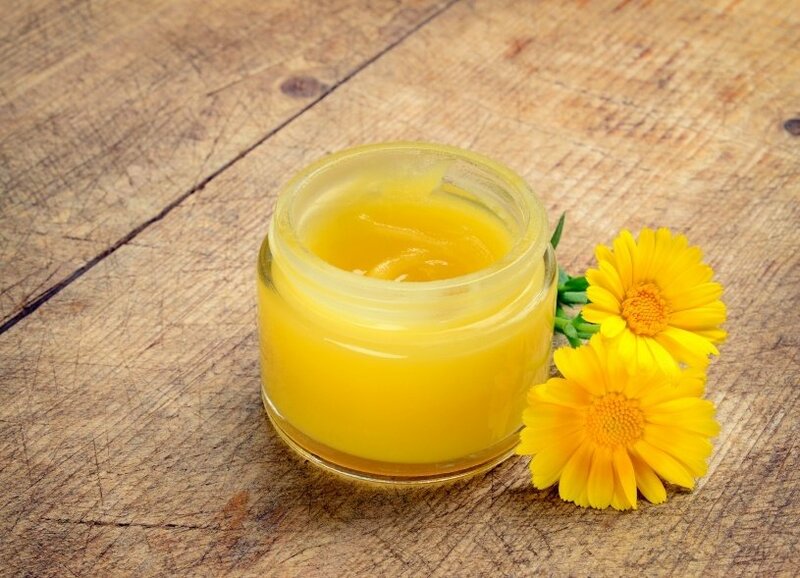 In addition to using it on your skin and hair, it has a myriad of other uses too, from treating insomnia and depression to relieving headaches, nausea and more. Here’s a closer look at why you should start putting it on your skin. As mentioned, lavender is best known for its calming effect. That’s why you’ll frequently see it in massage oils and the like. Not only does it smell good, but there is a scientific reason behind why it helps us to relax. Studies have found that the scent of lavender increases alpha waves in the part of the brain that’s responsible for relaxation. There has also been research involving the inhalation of the essential oil that has shown it can reduce both stress and anxiety. Use it on your skin by rubbing a few drops of the oil into your palms and then inhaling it, drawing the scent through your nose and up into the amygdala gland of the brain, sometimes called the “emotional warehouse,” to immediately calm your mind. You can also rub a couple of drops onto your wrist temples or feet to help calm the body. For a full-body calming effect, put a few drops in a warm bath. There are countless toxins in the environment, along with day-to-day stress that tax the skin, not only leading to signs of premature aging but sometimes causing immediate effects such as an inflamed, rough appearance. Lavender can help fight those common culprits thanks to its potent antioxidants that help to prevent and counteract the negative effects of pollutants it’s exposed to. Just like it calms the mind and your nerves, it can calm your skin. Making a DIY bath detox with lavender provides an incredible sensory sensation – combined with Epsom salts, this is an ideal recipe that will draw out toxins while lowering stress-related hormones, balancing pH levels and soothing your skin. Just add a handful of Epsom salts and 10 drops of lavender essential oil under the running water as you fill a warm bath. Soak for 20 minutes, ideally once each week. 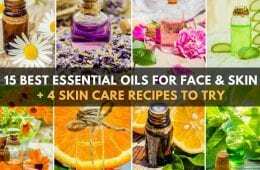 While you might think that putting an oil on your face would worsen acne, plant oils like lavender won’t clog your pores and the natural antibacterial and antiseptic properties can offer an ideal solution. Harsh chemicals and over-the-counter or prescription drugs can lead to further irritation, making the problem worse than it was to begin with, but essential oils like lavender have the power to kill bacteria on the skin naturally, as well as to protect it from irritation and stress. Lavender also helps to balance hormone levels while offering many other benefits that promote better skin health. To use it on your skin to treat acne, make a facial toner. All you need to do is combine a few drops of lavender oil with a tablespoon of witch hazel, dab a bit onto a cotton ball and apply it to cleansed skin. The lavender helps to heal a breakout while the witch hazel tones the skin. Lavender essential oil is great for relieving pain caused by sore muscles, thanks to its analgesic and anti-inflammatory properties. In addition to sore muscles, it’s been shown to relieve joint pain, back aches, and rheumatism. One study conducted by Hong Kong Polytechnic University found that massages utilizing lavender essential oil can reduce a person’s back pain by as much as 39 percent. You can simply massage the oil into the affected area, or if you have sensitive skin, mix a few drops of lavender oil into some coconut oil and then rub it in. Getting a regular massage with lavender oil is a great way to relieve joint pain. Inhaling it can help too, so you may want to put some in a diffuser at bedtime. Research done on postoperative pain relief found that combining lavender essential oil vapor into the oxygen significantly reduced the amount of pain experienced, versus those who only received oxygen after a major surgery. If you suffer from an injury, whether it’s a cut, burn, scrape or other skin wounds, you definitely want to put some lavender on your skin as its powerful antimicrobial properties help to prevent infection and combat bacterial and fungal disorders. It also helps to speed healing thanks to these compounds as well. There have been countless studies that have proven these effects. One particular study, conducted in South Africa in 2013, evaluated lavender’s antimicrobial ability when combined with other essential oils like tea tree, cinnamon and clove, and discovered that a 1:1 ratio was the most effective for battling two common causes of bacterial and fungal infections, Staph aureus and Candida albicans, which are known to lead to skin fungus and respiratory pneumonia. Lavender essential oil can be used on the skin to improve blood circulation. Blood circulation is an important part of your body’s overall health. An increase in blood circulation benefits the heart as well as the muscles and arteries throughout the body, improving oxygen-rich blood flow to all the extremities. One of the best ways to use lavender oil for this purpose is to dab a couple of drops of the oil on your skin, on the feet, wrists, temples, or wherever you’d like. Then lie down with your legs raised on a chair or against the wall. Not only does the leg elevation help, but you’ll get the benefits of the lavender essential oil too – and, feel a lot more relaxed by the time you’re done. By applying the oil to your chest, neck or back, it can help alleviate the symptoms of respiratory problems, including sinus congestion, bronchitis, a cold, the flu, cough asthma, and allergies. The stimulating nature of lavender essential oil helps to loosen up the phlegm and relieve the congestion associated with those conditions, speeding up the recovery process and helping the body naturally eliminate phlegm and other unwanted material. Breathing in the vapor of the oil, which provides antibacterial qualities, helps to battle a respiratory infection too, helping you to feel better faster. To boost the effects, try adding lavender oil to a diffuser and breathing in the vapors as well as putting it on your skin. While we enjoy the pleasant scent of lavender essential oil, it has been found to be offensive to many types of insects, including moths, mosquitoes, and midges, which makes it an excellent bug repellent. Add a few drops into a teaspoon of carrier oil and rub onto exposed skin when you go outside and you can prevent getting bit. If you went out without it and end up with a bite, you can use the oil to reduce irritation, pain and swelling, thanks to its anti-inflammatory properties. The skin on your head can be improved with lavender oil too. If you’ve got a dry, itchy scalp and dandruff, its powerful antiseptic and antimicrobial action makes it excellent for controlling the problem. To use it, mix 15 drops of lavender essential oil with 2 tablespoons of almond or olive oil, and then heat it up in the microwave for about 10 seconds. Massage your scalp with the mixture and then put on a shower cap. Let it sit for about an hour and then wash as normal. Lavender essential oil has also been shown to be quite effective for treating hair loss, particularly for those who suffer from alopecia, an autoimmune disease where the body rejects its own hair follicles. A Scottish study reported that more than 40% of alopecia patients noted an increase in hair growth when they regularly rubbed lavender essential oil into their scalp. When using lavender oil, it is imperative that you choose a 100% pure essential oil (and not merely a fragrance oil) that is free of additives and adulterants. As always, we recommend Plant Therapy Essential Oils for the high quality oils they provide, the affordable prices, the wide selection, the free delivery and returns for up to 90 days after your purchase and so much more! You can purchase a bottle of Plant Therapy 30ml Lavender Essential Oil from this page on their official website – and you can browse their extensive collection of oils here.